Salesvue is an advanced platform that offers graphs and reports to keep you up-to-date, while it also seamlessly integrates with your Salesforce account. You can select what information and data you would like Salesvue to display from your Salesforce plan. You can also create bespoke data sheets and findings based on your requirements. The Salesvue data can then be exported and downloaded for further analysis or fed into charts and graphs. Salesvue offers you the option to straight up dial and connect with clients and prospects via your dashboard. The app includes an ROI calculator that is free to use. You can avail technical support via phone and email (ticketing) based on your Salesvue plan. Transparent data and sales techniques: Features include lead nurturing, lead management, sales productivity, sales enablement, and sales automation. 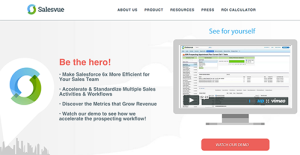 Salesvue fully syncs with your Salesforce platform, providing you updated transparent sales data and allows you to manage monitoring and sales campaigns. CRM analytics and real-time reports: Salesvue offers in-depth insight into your CRM’s sales performances and success. These finds can be exported to customized graphs and charts, and downloaded to PDF or stored for historical purposes. Create customer notes and client prospecting: Entries and notes created in Salesvue are synced with your Salesforce account. This eliminates the need for double data entry. Salesvue helps you analyze client leads and opportunities with accurate reports. This can give you more freedom for client prospecting. Online support and guidance, demo: Based on your Salesvue plan, you can make use of customer support including email and telephone. Users can also access online Salesvue video tutorials and demos to get answers for their queries. If you are considering Salesvue it may also be beneficial to investigate other subcategories of Best Business Intelligence Software collected in our base of B2B software reviews. There are trendy and widely used applications in each software group. But are they necessarily the best fit for your enterprise’s specific needs? A popular software solution may have thousands of users, but does it provide what you need? For this reason, do not blindly spend on popular systems. Read at least a few Salesvue reviews and consider the factors that you desire in the software such as the fees, main tools, available integrations etc. Then, shortlist a few systems that fit your wants. Try out the free trials of these products, read online opinions, get clarifications from the seller, and do your research thoroughly. This in-depth research is sure to aid you select the best software platform for your company’s special needs. How Much Does Salesvue Cost? We realize that when you make a decision to buy Business Intelligence Software it’s important not only to see how experts evaluate it in their reviews, but also to find out if the real people and companies that buy it are actually satisfied with the product. That’s why we’ve created our behavior-based Customer Satisfaction Algorithm™ that gathers customer reviews, comments and Salesvue reviews across a wide range of social media sites. The data is then presented in an easy to digest form showing how many people had positive and negative experience with Salesvue. With that information at hand you should be equipped to make an informed buying decision that you won’t regret. What are Salesvue pricing details? What integrations are available for Salesvue? I like that Salesvue is so easy to use. I can intelligently use helpful features such as A/B testing for selling, campaign cadence, and data segmentation.